Avid Blogs - "Editor Judith Allen Illustrates the Difference Between Cutting Animation and Live Action Films"
In live action filming, every action on set is accompanied by the corresponding sound. Often these are replaced or enhanced, but the sound is there and used within the rhythm of the cut whether consciously or unconsciously. In animation, every single sound needs to be purposefully placed – and often created from scratch by a foley team. It’s often a delicate balance between knowing which temp sound effects are best to place during the animatic to help tell the story and do the best cut, and which ones should be saved until after animation so as not to restrict the animators. At the moment I tend to make my sound choices based on how the characters need to respond to them in their headspaces more than how the final sound should be, because I know that the sound’s going to be completely replaced once we have the final picture, and because it will help the animation before that. 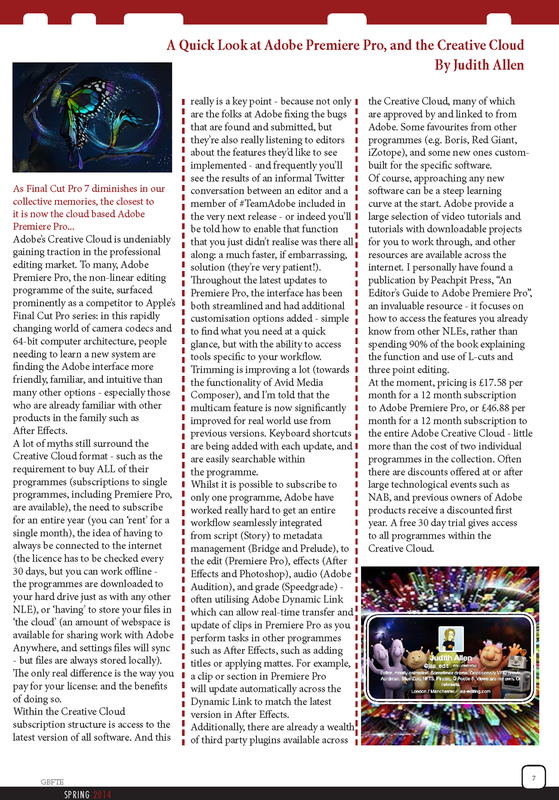 I was asked to write something for "First Frame", the magazine of the Guild of British Film and Television Editors about Adobe Premiere; who are one of the Guild's sponsors. The article was aimed at editors who were not already users of the software, and it was published in the Spring 2014 issue. N.B. Pricing information was correct at time of publication, check the Adobe website for the latest pricing.